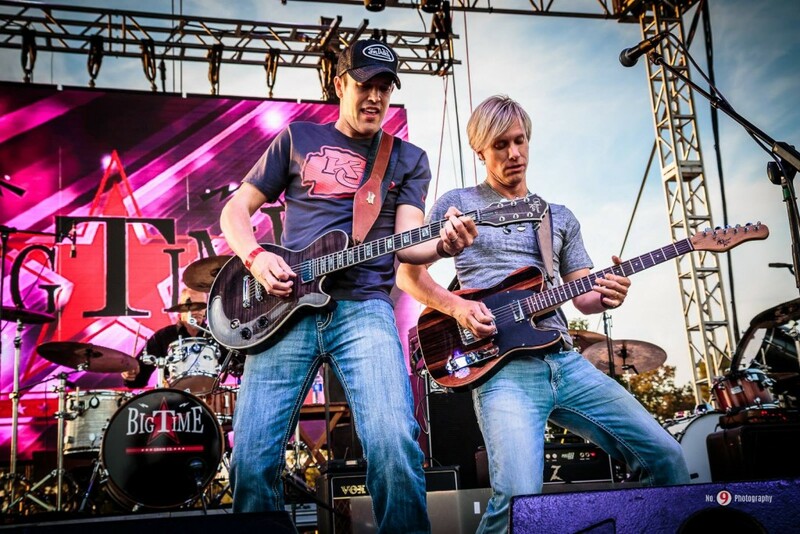 We talked to Chad Bourquin of Big Time Grain Co. country band. Herе’s what he told us! Hi there Chad, please introduce yourself and Big Time Grain Co. to our readers! What does it take to become one of the fastest rising country bands? This could potentially be a few pages, but if I could summarize some things we’ve done that have worked. We’ve identified and continue to get clearer on who and what Big Time Grain Company is as far as branding, sound, message etc. We have worked hard to have the right people in the right positions from players to management. Our manager meets with my brother and I every week as we continue to identify what are the absolute most important things for us to work on at that given time. We’ve never stopped working to improve as musicians, singers, songwriters, businessmen and leaders of the group. You’ve been playing lots of live shows in the past couple of years ­ where’s your best experience so far? Haha, this one is lot easier. We were extremely fortunate to be chosen to be the one act to perform at the Royals World Series Celebration for a crowd of a half million or so. That was kinda intense and very cool. What does it take to make a great live show? Great gear, energy, listening but probably most important is just having fun. It’s hard for an audience to not have fun when we are having a blast. Explain your workflow to our readers ­ how do you usually make a new song? Bret and I both bring songs to the table and so that can vary depending on who brought it. If I bring it, it usually starts with a lyrical hook or concept that I can develop a story around. A lot of those stories are personal experiences but some of them are stories I have witnessed or been impacted by. From that point, I or we start to develop a melody and somewhat of a chord progression. I use a capo a lot during this process to help identify what key it may sound best in. Bret has a very deep and resonate voice, so I always try to think about highlighting that in a song. Although being a guitar player, I decided the other day I’m gonna get back to starting with some riffs just to shake it up. I don’t think there is one right way here. It’s more what is inspiring me at the time. You’re very active in promoting the band online ­ how did you start building your marketing? Sharing knowledge is important for us and our readers, so we’ll appreciate some tips and tricks from you. We’ve learned a lot from a program put out by Rick Barker at musicindustryblueprint.com. He was Taylor Swift’s original manager and а huge part of her initial success. The overall resounding lesson we have learned is to be givers. This doesn’t change online any more than it does in person. Nothing can get more annoying than running into someone you know and all they do is tell you how great their band is and they go on and on. It’s no different online. Continual self-promotion will wear people out. Continual interaction will draw your fans closer. What significant problems do you find in the music industry’s condition nowadays? We have chosen not to even acknowledge today’s conditions as problems. My grandpa and dad used to tell a story about a guy who made a killing during the depression. He witnessed that people who had no money for entertainment would all just hang out on Mainstreet. So he sold them popcorn. There is more opportunity now for the independent artist than ever. Even though a record label can help launch you into the stratosphere at the right time, they don’t dictate anymore who gets to be on that playing field. We’ve chosen to treat this like any other business and are completely fine if we go through the entire career without any label. If one comes along and it makes sense, we’re good with that too. That doesn’t mean we are doing it alone, though. We continue to add to our team with great people as we can. I think you guys are on to something. I am just now figuring it out, but I like the idea of the networking aspect with other musicians to write, find good players, etc. What struggles have you faced as musicians so far? You know, honestly, my biggest struggles in life have always been self-imposed. So, since art imitates life, the more I get out of my head and into my heart, the better things go. If you had to give three major pieces of advice for novice musicians what would they be? 1. Identify that one thing or gift in life you have and make it the main thing and pursue it with all you have. 2. Surround yourself with people better than you and avoid the negative ones. 3. They say it takes 10,000 hours to master anything, so there you go. Do you have in mind any fresh artists for us to check out? Yep, there is this young girl here in KC named Sara Morgan. Great song writer. If you could change one thing in the world, let’s say you are the ultimate king, what will it be? What new cool band you have recently came across with? A buddy of mine posted a video from these guys a couple days ago. It’s ridiculous how talented these guys are. Never heard of you guys but you seem to do great music! +1 fan!